The quality of being honest and having strong moral principles; moral uprightness (honor, righteousness). The state of being whole and undivided; unified, unimpaired or sound in construction; internal consistency or lack of corruption. 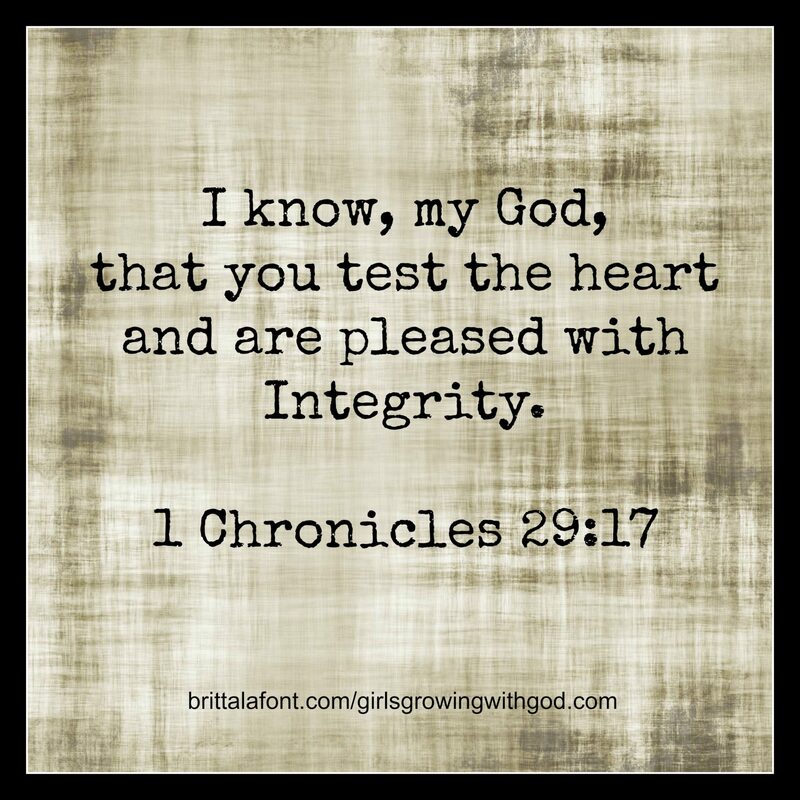 This year I want to dive into a study of Integrity. I was struggling a few months ago with my heart…trying to figure out how to let go of some hurts and disappointments that have somehow defined me. How can we show love to someone who needs, but doesn’t seek, our forgiveness? What do we do when God’s choices for us bring us grief rather than peace? How can say we trust in the Lord, when we question His ways? These questions all have the same answer: We need Integrity. God nevers lets me get too comfortable. The more deeply I know Him, the more I see my need for Him, and the more I see my own shortcomings. I guess I have always struggled with these same questions…but as I grow in the Lord, I realize that I cannot be comfortable with such inconsistency within myself, because He is not. God has allowed some hard things in my life some have brought me closer to Him and others have left insidious traces of bitterness that cannot please Him. At the end of the day, if I do not please the Lord, I am lost. James says: Count it all joy, my brothers, when you meet trials of various kinds, for you know that the testing of your faith produces steadfastness. And let steadfastness have its full effect, that you may be perfect and complete, lacking in nothing (James 1:1-4). Jesus says it in another way: “Therefore everyone who hears these words of mine and puts them into practice is like a wise man who built his house on the rock. The rain came down, the streams rose, and the winds blew and beat against that house; yet it did not fall, because it had its foundation on the rock” (Matthew 7:24-25). I have written about this verse many times and in many ways so I see God bringing this all full circle for me. What He is showing me again, and again, is that there can be no peace in our lives unless we submit every portion of it to Him: our thoughts, our relationships, our desires, our work and our hurts…we can hold nothing back from Him, because even if we do, He still has authority over it. We must reconcile ourselves to Him…reconcile means to make two things agree with one another. This is done by operating in Integrity, laying down our old ways and following His Way. There is no wholeness for us without obedience to Him. Please share in the comments about how He is calling you to Integrity maybe we can seek this better way, together? Sometime I have struggling with things in my life that only MY GOD could help me with .Then someone dear to me gave me this verse. YOUR CROSS The everlasting GOD has in His wisdom foreseen from eternity the cross that He now presents to you as a gift from His in-most HEART. This cross He now sends you HE has considered with His all-knowing eyes understood with His divine mind, tested with His wise justice, warmed with loving arms and weighed with His own hands to see that it be not one inch too large and not one ounce too heavy for you. He has blessed it with His holy Name, anointed it with His grace, perfumed it with His consolation, taken one last glance at you and your courage, and then sent it to you from heaven, a special greeting from GOD to you, an alms of the all-merciful love of GOD. This has help me get through a lot knowing my GOD has me at all times. While my “cross ” to bear is unmatched to His, I must celebrate the trials …the place where He can display His integrity…as undeserving as I am…. I love hearing your heart speak! Thank you for the comment! Let’s walk this Way together! Are you doing a guided study or just your own? 2014 is starting of with a bang of challenges for me so I’d love be held accountable in this area as the year continues.